-Ensure your safety from oncoming traffic! Move the pet and yourself to a safe location. If you are unable to carry the animal, and there are bystanders, ask them to safely stop traffic and to assist you. -Be aware that otherwise friendly animals can lash out when in pain or stressed- use a makeshift muzzle for dogs from items such as belts, socks, leashes, scarves, shoe laces and shirt sleeves- If your dog appears to have difficulty breathing, do not use a muzzle- use a blanket to wrap the animal, trying to avoid pressure on injured areas and keeping your face away from its mouth. -Small and medium sized dogs can be carefully lifted and carried. Wrapping a small dog in a blanket or towel will provide warmth and security. Larger dogs pose a greater challenge in terms of moving out of the roadway and transferring to a vehicle. A sturdy blanket is an ideal multipurpose tool. A blanket can be used as a sling for dogs with leg injuries, yet able to walk. A blanket can also be used as a stretcher for severely injured or weakened dogs. 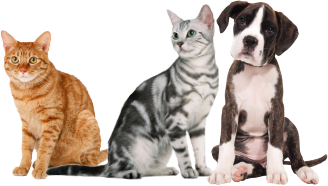 -Where possible, call the nearest veterinary hospital or emergency centre to notify them of the situation and your estimated time of arrival. You can provide helpful information over the phone such as whether the animal appears to have a specific injury, any sites of bleeding, difficulty breathing, and whether you suspect head trauma has occurred. By knowing you are en route, the veterinary team can be prepared to help transfer your dog into the hospital and can assemble emergency equipment such as intravenous catheters and fluids, x-ray machines, oxygen masks and pain medications. -Even if you believe your dog has not sustained a major injury as a result from being hit by a car, it is crucial that he or she sees a veterinarian as soon as possible. Even if there are no serious external injuries, there can be a variety of internal injuries following trauma that may be difficult to detect just by looking at the animal.